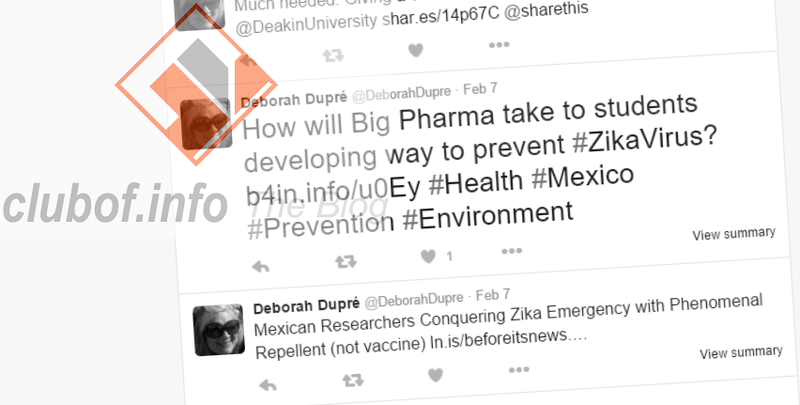 The clubof.info Blog: Mosquito repellent to deter Zika virus? Students from a university in Mexico have taken it upon themselves to research and create a whole new type of mosquito repellent, in hopes of reversing the terrible toll of the Zika virus carried by mosquitos. The Zika virus has been causing birth defects, with the virus' recent explosion in lethality and hospitalization spreading throughout Brazil and other parts of South America and arriving in Central America, including Mexico. As a result, officials have sought to improve access to birth control to suppress the scale of birth defects. Citing information from the National Science and Technology Council in Mexico, human rights and environmental expert Deborah Dupre says the mosquito repellent stands out from traditional repellents because due to being 60% less expensive. Made from on plant-derived chemicals creating three different types of oil to repel insects, the new type of mosquito repellent is to be marketed under the brand name CitroRepel. Dupre referred to the mosquito repellent as "phenomenal" due to its low cost and lack of harmful ingredients associated with older chemical products.